Advanced Practitioner who you connect with. connect with your Advanced Practitoner who lives across the globe! Ask about phone sessions and even Skype sessions. Rudy Hunter is very proud of this crew! Advanced Practitioners are not listed in any particular order. ​Each Practitioner's session and fees are unique--contact them to find out! your mind, body, affairs & life. HOVER YOUR MOUSE OVER OUR ASHWORKERS PHOTOS AND WATCH THE SLIDESHOW OF THEIR LOVELY FACES! 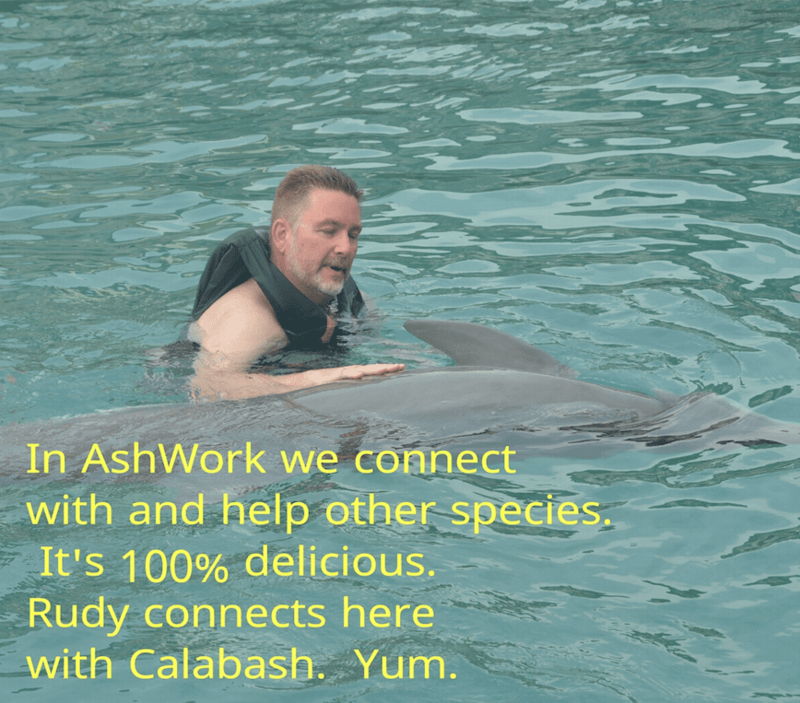 ​Click on your AshWorker's photo to go to their website/get their contact info. These Advanced AshWorkers are Divine Beings! Advanced AshWorkers get with people & animals? a side effect. Rudy, I can’t thank you enough for so generously teaching us these methods of healing which you created. It is truly amazing to do this work. Several months ago, I did ash work on a 50 years old female Latina who is blind %100 on her right eye and about %90 blind on her left eye. I did a Dive round on her to make her sight better though she claimed this issue is hereditary. involuntarily for about five minutes. experience and she hugged me. In another sessions I worked on her nervous system and family issues. A client asked for assistance with her Christmas Craft Bizarre...She was quite nervous and concerned about this first time experience for herself. I did three rounds of ASH on her and one round on her sales space. "Tessa, Thank you SO much! It was wonderfully busy for me and highly successful in both energy and money! The other vendors were remarking how slow it was this year, but my booth was packed with people most of the time!" Such an honor for me to help others. swelling had reduced dramatically. Two days later, the gashes were completely healed without any scarring. Thank you for the healing Chipo. the baby for the first 2 segments, then she fell asleep suddenly and I felt such a strong sense of energy after that. I almost could have fallen asleep it was so intense. In the immediate hours after I felt out of sorts. I felt a huge desire to have a bath and when it didn't happen I was so upset and started to cry. It was like a release except it didn't really finish releasing then, yesterday I could feel myself still processing and feeling uncentered. Today my neck feels much better and relaxed and I'm much lighter. It was very powerful the energy that was around me. I felt like I could reach out and touch it, like another person. I was staying with a friend for a few months and he was involved in a very dysfunctional relationship. Every night around 10 PM he would take his phone into the other room and I would hear the distant sounds of him fighting with his girlfriend and I would have to turn the TV volume up to block out the hostile energy. I suggested and offered to do Ashwork for him many times and he always refused, but finally he agreed to try and we did a short session one night at around 8PM. We did a round on the thought form “ we can’t have a phone conversation without fighting” , We did one round on his experience of their relationship, and we did an M2 round that showed that they were both independently happy and whole. We continued the sessions and these peaceful nightly calls continued. I guess this is my favourite AshWork experience because i literally got to experience the result rather than just hear about it. I’ve never doubted that Ashwork works, but I love this experience where I can actually see the shift out of an unhealthy pattern in someone that I care about. buttock and all over the legs." The back pain was much less than at the beginning of our session, the next day the back pain has gone. I worked on a client 3000 miles away. That person said they felt an ongoing stomach ache, back pain that made it hard to stand up and walk, anxiety, worry, anger and depression. I did progressive ASH rounds on their head, inside the brain, stomach, back,heart and liver. As a result, they said they felt better and had were no longer worried about money, and had no pain in their stomach or back, could move around and walk fine, and felt calm and good, they way they used to feel and the way they said they thought they should feel. That person reported continuing to feel good the next day and week. Ashed person and physical condition. Result showed up in situation. Situation: Client in highly pressured situation - due to attend a hearing. Was experiencing medically diagnosed stress-related physical symptoms. Employer was persistently uncooperative. Action: Ash Work on the physical condition/symptoms. Result: Slight reduction in symptoms and feelings of stress. Unpredictable events. Employer behaved unpredictably. Led to an adjournment and delay in re-scheduling the hearing. The time-gap allowed hidden information to emerge that showed the employer had pre-judged certain matters. This allowed significant relevant information to be presented within the hearing (otherwise it would not have been available in time and would have had to be excluded). A young lady with 2 small kids had some issues in her nose. She had difficulty in sleeping because she couldn't breathe well. Doctors said she needed an operation but added they can't guarantee anything. She had loss of the ability to taste and smell.She came to me and we started to work twice a week. The same next week.She said she could breathe and sleep better and had more patience with the kids. They went out with the children at the weekend. Boys wanted to eat so they parked outside a restaurant. She preferred to stay in the car. Suddenly she noticed she could smell the delicious scent of the kebabs! She called me and told all about it. She was so very excited because doctors told her maybe she could never have the ability back! ​I felt so happy too. I have a client that was named in a lawsuit which needless to say, was very distressing and impacted her mental & emotional wellness as well as sleep. My client found ASH work to be extremely helpful in quieting the "monkey mind", being able to refocus her attention and restoring healthy sleep. Over the course of the 18 month litigation process, we found a few quick rounds were very relaxing & beneficial and repeated when necessary, or when new facets of the issue were revealed. I had a client with severe sciatic pain, after a few tradtional rounds of ash work I ended with M2, the pain dissolved in real time. Love it and she like being involved as well. the space between her heart, her heart valve and herself, as well as rounds on her work situation. She called me, which was unusual in itself, to say that she had actually had the energy to do her hair, put on make-up and drive to the supermarket. This was after weeks of not even walking as far as the mailbox. She also said, "I'm not sure what you're doing, but thanks! Late October, walking a beach an noticed a large animal (bigger than a seal, smaller than a whale) just about 25 yards offshore. I thought it might have been caught in fishing gear, but I wasn't brace enough to jump in to assist. Stopped walking and did 3 quick rounds of ASH. The animal seemed to disappear. herself. We told the harbor master, and he confirmed that something injured had been around for a couple of days. Got a text the next day that the manatee had been rescued by the aquarium staff later the afternoon. Harbor master was great about updating on the rescue....yippee for walking meditation! I have a rescued Hound Dog who had an apparently traumatic life prior to coming to us. As a result he is a pretty go-with-the-flow and don't-make-waves kind of guy. One of his major issues was that thunderstorms terrified him. After learning Ash Work I started doing it with him during the storms. The Ash Work did as I expected it would, meaning that his fears have lessened greatly. What I did not expect was that his confidence increased immensely. He is more comfortable expressing himself and his wants now. The one that makes em laugh the most is that when our walks are about over and I turn onto our street, if he has not had enough he now sits down in the middle of the road and will not move until I head into a different direction! I worked on a lady that had not been able to use her arm in a couple of months. I offered to try one round of ASH energy on her arm. She felt some tingling whch was the first time she felt anything. The next day, she had 80% use of her arm, with minimal pain. That evening she was even better! The day after that, she had 100% use of her arm again, pain free! A client is a film music composer. He wanted to connect with well known film composers in the industry. We did informal ASH work rounds, sometimes once, sometimes twice a day. I encouraged him to lightly focus on the request and to 'let go' of how and when connections would happen. In less than a week he was in a local restaurant with a friend having dinner. In walks one of the more well known film music composers in the industry. The client was 'blown away'! He was able to meet and talk with this industry 'giant'. Recently, I had the pleasure of working with a client in person. This added a dimension to my experience as a healer because the majority of my sessions are done on the phone with people who live far away. When the client came to me she was obsessing about feeling abandoned because her daughter got a new job and was moving across the country. She told me, "I know my daughter loves me but every cell of my being screams "don't leave me! I know my daughter's success is my success as a mother and I want her to go forth and have every adventure her heart desires but the voice inside me keeps screaming "don't leave me!" We did our first ASH round on the space between her rational thought about her daughter starting her new job in a far away place and the raw, emotional feeling of abandonment she felt when she thought about her daughter leaving. At the end of the ASH round I got the special pleasure of seeing the look on her face as she had an understanding about the situation. She said, "Now I know why this is so upsetting. It is because I am unloveable." Wow! Now there's a powerful insight! I was completely in awe. Her posture had changed, her face radiated selfassurance, and the light around her was visibly brighter! She expressed how at peace she felt when she thought about her daughter leaving and how she knew she was loved. I worked on a client who had been experiencing shoulder pain for about a month. She didn’t have a significant injury; she just thought it was from stressing and overworking the muscles with bike riding and extra sewing sessions. When we started her pain level was a 4 and had very limited range of motion. She was unable to raise her left arm even to 90 degrees. ​We worked for about 30 minutes and by the time we were finished with the session, she was pain free and able to move her arm across her body, up above her head and across her back. She couldn’t believe the shift since she had been resting it, going to the chiropractor, having massage and stimulating some acupressure points with limited improvements that didn’t last. We did several rounds of ASH work, three of which were energy drains that really made a difference. We ASH’ed the emotions of frustration, annoyance and aggravation that she was experiencing. And, we added some yin energy to create more balancing in the area. This client was thrilled with the results since she was beginning to think she needed surgery to correct the problem. Truly amazing what energy work can do! said she was enraged at her sister, who would be there. There has been a pattern of conflict between them since her birth. I offered her a round. I asked her to share a bit about the anger, and mutual jealousy jumped out at me. I did a round with a Venn of friend/relationship with her sister/jealousy. After about 30 seconds she started to weep- themes of feeling unloved, unwelcomed, having to hide her talents. After I completed the round, I suggested another round (thinking to myself- oh dear, the party's in 30 minutes and we've opened Pandora's box and thrown away the lid!). It felt perhaps too general, but I went with a 4-way Venn of friend/conflict with her sister/all its roots/all its effects. End of round- "Nothing. Totally clear. No more charge". And a good time was had by all at the party! And they have continued to have a “friendlier relationship” and supported each other in surprising ways. Mikey was one of the main inspirations for AshWork -- as he instructs Rudy on this cold morning! I did a session for a client I'd never met who was having trouble selling her condo. It was hardly attracting any visitors and she had taken it off the market. She wondered if the energy was out of balance. also another personal issue she mentioned regarding money. The first round was done using a Venn diagram on the cluster of issues in her life around the importance of money. The client started at a 7 and it went down to a 2 -3. The second round was focused on the space around the doorway where she entered the condo. The round started at an 8 - 9 and reduced to 4. 2. She felt it was a good place to stop. ​six months. ASH? GONE !!!!! I have added this to my private practice these past months since Feb – Mar when I purchased the initial classes. It has contributed to making my practice more fun and definitely more powerful in terms of results. I am most grateful and will continue to bring this work to my clients. I also use it almost daily on myself and know the difference it has made in me. significant bloating and soreness in the intestinal area (level 9 discomfort for both issues). one M2 round, the bloating and soreness went away. She also regained confidence that her overall health would continue to improve. My 54-year-old friend had been looking for work for over a year. She was older and overqualified for most jobs. She rarely got a call for an interview. She was super stressed and very worried about her financial future. I sat in my garden one day with her on the phone and did a 3-minute DIVE round on her and all her stuff around the issue, me and all my stuff around the issue, and the issue. When we were done, I energetically heard a phone ring so I said, “Don’t be surprised if you get a call soon for an interview.” She texted me 30 minutes later and said she’d just received a call for an interview! It turned out to be her dream job and she was hired! This is interesting , because the result also effected me in a most immediate and positive fashion ...I was helping an associate with whom I closely work and whom at the time was depressed and frustrated because through circumstances she could not control and indeed circumstances that effected me also had rather adversely effected a business that we both have substantial interest in....she was asking and needed something that could dramatically turn it around, but she also stipulated that the solution she needed could not compromise or interfere with her ailing business, but also had to have the quality of fun to it as it also generated more income for her while supporting and promoting the business she was trying to recover...ugh! I worked on a client who felt dizzy every time she changed position, getting up or down, turning around etc. i did one round of M2 and her symptom disappeared. It came back a few weeks later, we did M2 again and so far she feels fine. When I first began learning ASH work, my grandson was playing baseball. he was at bat and a wild pitch was thrown hitting him in the right upper shoulder. I asked his mother if I could send him some ASH to the injured area. She approved and I proceeded to send the healing. After the game I asked him how his upper back/shoulder area felt. He said it was sore but not bad. We looked at the area where the ball hit and found the marks of the lacing of the baseball on his shoulder. A few days later the marks were fading but there was never any bruising or swelling or pain. My friend raises goats and came to me asking about how he could help his male goat with depression. The goat was staying towards the back of the fence with his back turned and was not responding to my friend. The male goat had just lost his mate during the birth of a kid and he was seemingly depressed. I said that I would send the goat some ASH. In a few days my friend came to me very excited and suprised saying "I don't know what you did or how you did it but Julio(the goat) is completely changed. He is friendly and not depressed anymore". My dog Ronan likes to lick his paw till it requires salve and homeopathics.It drove me crazy and was so bad sometimes he would limp. I did several rounds of ASH work on his Paw and several rounds of ASH work on my reaction to his Paw issue. IT has not come back. While visiting friends, their daughter was really cranky & in a lot of pain in her back & lower abdomen due to her menstrual cycle. Apparently, this was a regular occurrence & she always suffered for days with it. I told her that I do energy work & maybe it would help her. She said, "Can you do it right now?" I did 3 rounds with her. One, in & around her lower back. She looked at me & said, "My back doesn't hurt anymore!" I did another round on her lower abdomen. She told me it was a bit better but still painful. The last round I ASHed in & through her female organs. Still some pain, but she was really sleepy & went off to bed. I was still there when she came back out 2 hours later with a big smile & no pain. She said that she just woke up & felt great. How awesome to see the change! !